Researchers have set up a "collaboratory" at the University of California, Berkeley, to come up with a spacesuit that will allow expeditionary crews to work effectively on Mars. "It's not like the spacesuits of the past, those used in Apollo, for the space shuttle or to carry out spacewalks from the International Space Station," Kuznetz told Space.com. "So it's a fresh sheet of paper for a planetary suit to use on Mars. You are talking about a planet. You're not talking about space or the moon, where the environment is always the same." Team members tackle the inner and outer workings of a Mars suit at the University of California, Berkeley. 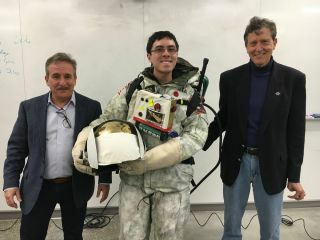 "The long-range vision is to have this course semester after semester," Kuznetz said, "with each semester building upon the work of the prior semester … all intent on maturing the MarsSuit design." A "collaboratory" setting taps the talents of a multidisciplinary network of experts to design a spacesuit for Mars. The MarsSuit Project draws from earlier work done by Kuznetz: the "K suit," which separates the helmet from the torso in a hybrid dual system. "Mars is more like Antarctica … and it has an atmosphere," Kuznetz said. "What you can get from the Mars environment is carbon dioxide, and that it's cold and it's dry. Those three things give you a real leg up." The MarsSuit Project team is focused on a two-suits-in-one concept, Kuznetz said. The helmet contains pressurized oxygen, and the Mars atmosphere pressurizes the rest of the suit. A neck dam separates the two components, Kuznetz said. Taking that approach, he said, means the suit won't need heat exchangers, fans, pumps or liquid-cooled garments, and this will reduce the weight of a Mars explorer's portable life-support system. "Another big plus is that if you have a puncture in a traditional suit, you've got 11 seconds of useful consciousness to fix the problem," Kuznetz said. "If you have a puncture in this suit, you are losing carbon dioxide. You don't give a damn, and you have got extended survival time to fix the puncture. You don't lose oxygen. That's what makes this design so different." What will a Mars spacesuit look like in the future? To maximize an explorer's productivity on the Red Planet, different types of suits are needed from those used by Apollo moonwalkers, experts said. Those taking part in the MarsSuit Project have come up with a number of other ideas. The team has scoped out a lightweight, integrated radiation-protection device, for example. Then there's alert, caution and suggestion software that would serve as a personal mission control while an individual worked on Mars, far from Earth. Also under consideration are suit layers that could be peeled off and put back on, as needed depending on the Martian weather. "What we're doing here is not letting engineers dictate the design of a spacesuit, of having a suit become a slave to engineering," Kuznetz said. "Rather, let's have science and the Mars environment dictate the design of the spacesuit. And that's where we are." Kuznetz said a potential human landing on Mars in 2032 would require NASA to release a request for proposals for a Mars suit 10 years prior, in 2022. "It's now 2017, and in five years, I want to have an integrated, university-industry expert team [ready] to actually make a bid on that suit," he said.